This is obvious and boring but I thought that I'd put itin. When you buy GW bases they are on a spruce, when these are ripped off this normally pulls a bit out of the base and looks unsightly. The better option is to clip them from a spruce or use a modelling knife but there will still be a small bumb which again will look unslightly. This is shown in picture 1. The best way to get rid of this, especially if you are looking for a display level of finish is to go get some fine sandpaper, the grade I use is 600 and I get it free from work but any DIY store will stock it - the finer the better. After a few strokes the base rim is flat as show in picture 2 (with the sand paper underneath) - be careful though too much sanding and too much material will be removed and the base will no longer be round. As a final point, if you cant be bothered to do this at least glue the model to the base so that there are no bumbs/divets at the front of the model. Anyway I just glued a single rectangular one underneath the base using a shed load of super glue although two part epoxy glue would also do the job. I have used this company for years and they stock most things that you need that GW don't sell (cheaply or otherwise). I recommend their 1mm drill bits and 0.8mm brass rod for example. 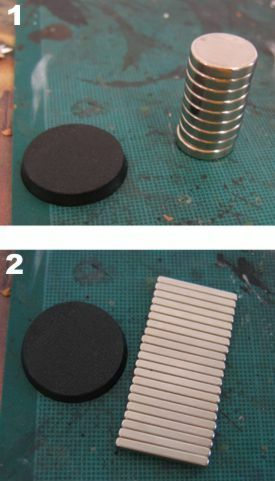 This sheet was machined down to the same diameter as the top of the Games Workshop bases. If you would like some then pm me and I'lll get you some. I can make them for any reasonable base size. This was glued on using Citadel glue because the brush was useful, a dropper would have meant that when the top was put in place it would have gone everywhere. Anyway the piece was painted boltgun metal and then dry brushed chainmail. 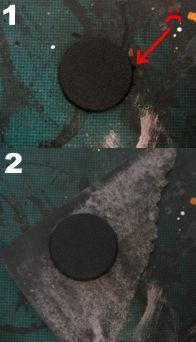 Same as 1 but the painting was done before gluing it on so that the drybrushing did not get onto the black base between the holes. This is just the raw aluminium top glued on. I actually prefer the third option it looks the cleanest in terms of construction, it is also the easiest to build. I think that it gives a nice neat finish that hopefully is a bit different and should look quite striking. However unlike typical bases using sand and the like the feet of my miniatures will have to be painted and cleaned up to a higher standard than ususal. When you glue sand or flock on you know that the feet will be obscured to some degree but to pull off this basing method I'll need to be a bit more careful. I am planning on adding some detail to the bases (future post) so that the base isn't so bland. Just a short point on glue, I use superglue for plastics and metals. 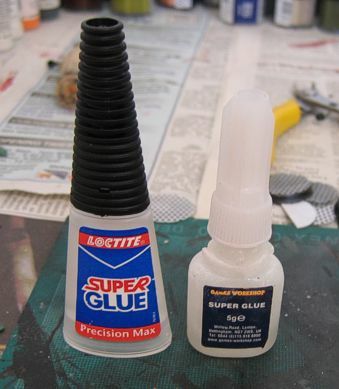 Many people mention that they have a problem with Games Workshop glue in that it does not bond particularly well. I have never had that many problems but I pin everything. Some things have definitely come loose over time but whether that is due to wear and tear is difficult to say. It's cheaper for more, it also has a great dispensing mechanism (although the GW brand brush is useful for this basing method). You can get this glue in WHSmith and Woolworths in the UK. I also came up with a more advanced scheme for my army that I may reserve for characters or the odd unit leader. I bought some steel tread plate plasticard from 4DModelshop and machined this down to the same diameter as the aluminium sheet. Pairs of each were then chopped so that mirror pieces of each material could be paired to create a single base. Does that make sense ? Well the picture should exlpain this. 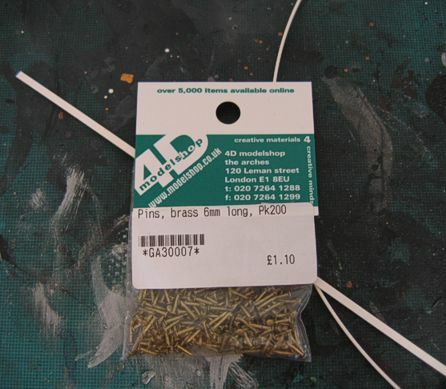 Anyway here are some brass pins and some ASA rectangular shaped strip, again from 4DModelshop. Picture 1: The first stage was to glue the two reciprocal pieces together, then a piece of the ASA was cut so that it would cover the join. The end were filed slightly to correct for the curve of the base and then it was glued in place. Note that here the pieces are actually larger than the top of the base, this was a mistake when I machined them but for a test it shows the principle. Picture 2. Three holes (~1.2mm) were drilled for the rivets. Picture 3. Three pins were glued in place, since the pins are brass they can easily be clipped from underneath. That's it really, it would require more painting but it looks OK, the mistake I made was to not cut the aluminium and plasticard along the line of the holes/tread it looks a bit odd at an angle and would look more natural if the join was parallel to the detail. Again if anyone wants to buy a basing kit to build bases like this pm me and I'll sort it out.